The condition or quality of being loquacious; talkativeness. Referring to people who talk or write in a pompous manner or who are extravagant in their speech: In order to impress his teacher, Sam typed his essay in a quite magniloquent way, with flowery and high-sounding expressions. © ALL rights are reserved. 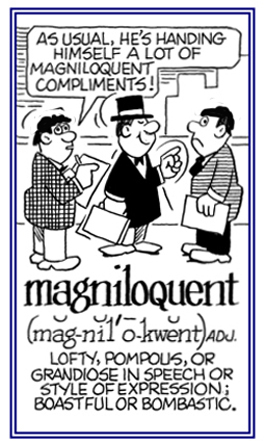 Magniloquence; that is, speaking in, or characterized by a high-flown often bombastic style or manner of talking. Communication between individuals who can't hear: The system of maniloquism is used by the deaf who use symbols made with the hands and fingers. 1. Speaking sweetly or harmoniously. 2. Literally, “honey-tongued”; a glib or fluent speaker. 3. Pertaining to a smooth talker or a con artist. A reference to talking in a harmonious or sweet manner. Telling artful lies or presenting false words: The governor's mendaciloquent excuses that he was innocent of charges that he was taking drugs didn't convince anyone because pictures revealed the truth. Talking a great deal; talkative. 1. 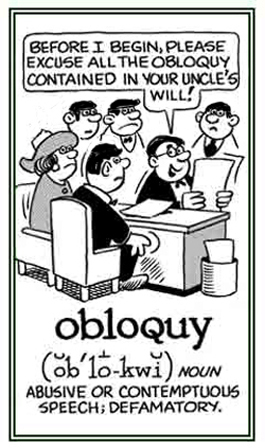 A state or condition of disgrace resulting from public abuse or defamation: The head of the secret police resigned in obloquy because his department's secrets had been leaked to the press. 2. 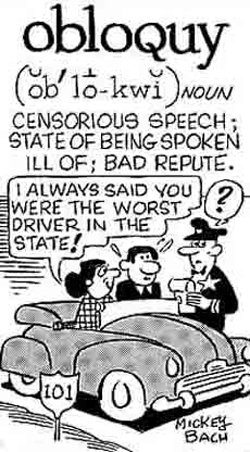 Evil-speaking directed against a person or thing; abuse, detraction, calumny, or slander: The newspapers engaged in vicious obloquies against the corrupt city official. 3. Evil reputation, bad repute; a disgrace: The gangster tried to make up for his history of obloquies by donating great sums of money to charities. © ALL rights are reserved. Talking about everything; speaking about everything or on all subjects. Showing page 5 out of 8 pages of 119 main-word entries or main-word-entry groups.